Funded by the Arts & Humanities Research Council, ‘Africa’s Sons Under Arms’ (ASUA) is a four-year research project that started in October 2014. It uses Britain's West India Regiments (WIR) to explore the relationships between the arming of people of African descent and the changing nature of racial thought from the late 18th to early 20th centuries. 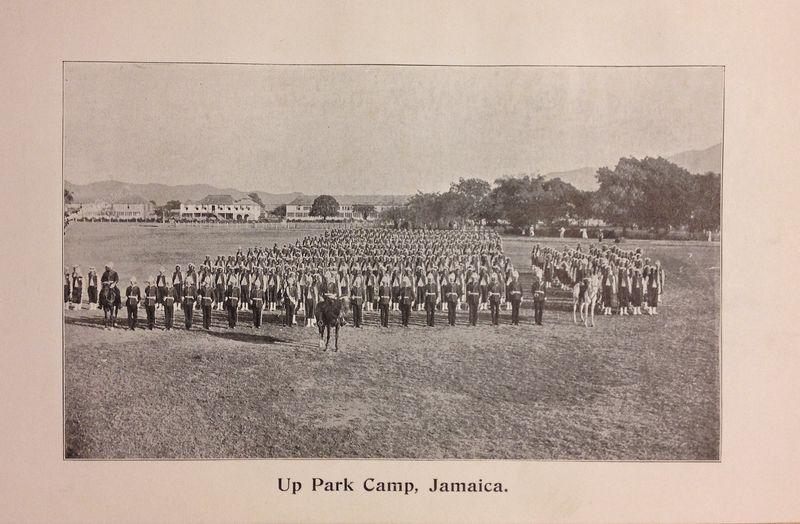 It comprises three interrelated components that examine WIR soldiers from different perspectives: as objects of medical scrutiny during their time in the Caribbean; as figures of public interest who served within the wider British army; and as participants in organised sport watched by local and visiting spectators. The first two components have associated PhD projects. ASUA is a collaboration based on well-established relationships between the three main investigators (David Lambert, Tim Lockley and Elizabeth Cooper and the two partner research institutions (Warwick's Department of History and the British Library), and drawing on the scholarly and outreach expertise of both. At Warwick, this scholarly expertise includes a School of Comparative American Studies, with three academics who work on race and slavery; a Centre for the History of Medicine; a Global History and Culture Centre, which contains experts on African history; and interdisciplinary Yesu Persaud Centre for Caribbean Studies. The British Library, meanwhile, has a dedicated team of curators associated with its Americas Collections. Banner Image: Detail from 'View in the town of Belize...taken from Fort George' (1848). Courtesy of the Anne S.K. Brown Military Collection, Brown University Library. The WIR was formed in 1795 from remnants of the Carolina Corps of black soldiers recruited by the British during the southern campaign of the American War of Independence (1778-82). British defeat led the evacuation of c.5000 enslaved and formerly enslaved people, including black troops. The WIR became vital for the defence of the British Caribbean colonies and also served in West Africa. The soldiers of the WIR were objects of scrutiny by doctors, slaveholders, travellers, photographers and others, who depicted and interpreted their bodies in complex, often contradictory ways. The project's components will utilize these viewpoints while not forgetting the agency of the soldiers themselves who were able to shape racialised ideas through their behaviour, dress, abilities and actions (in battle, on parade and while playing sport). These interactions took place against a backdrop of debates about racial capacity and the British imperial 'civilising mission', and the end of slavery in the British Caribbean. The militarisation of the black subject is comparatively under-studied, yet is crucial to our perception of the plastic nature of race as a concept. Whites who feared armed black men were willing, when circumstances dictated, to place them under arms. This project aims to explore such ambivalence, explain how whites 'rediscovered' the black body in the late 18th and early 19th centuries, and how evolving white understanding of the black body from passive slave to armed combatant was crucial to changing ideas about race in the Victorian period. The time-frame of 1795-1914 encompasses the French Revolutionary and Napoleonic Wars and War of 1812; the abolition of the British slave trade and slavery; British involvement in West Africa; the Crimean and US Civil Wars; and the later 'Scramble for Africa'. This period saw the WIR involved in intra-imperial conflicts in the Caribbean, suppressing slave revolts (Barbados, 1816) and post-slavery rebellions (Jamaica, 1865), as well as fighting colonial wars in Africa. The project's broader historical context is provided by the Haitian Revolution; public debates about slavery and race in Britain and the USA; the growing importance of science to the medical profession; and emerging ideals of Victorian heroic masculinity. Deliberately, the project does not encompass the First World War. Instead, at a time when the 'Commonwealth' (sic) contribution to that War is being assessed, it is timely to consider the extensive and more varied history of black soldiers in the British Army. The geographical scope of the project is focused on the Atlantic world, including the Caribbean, West Africa and Britain, but also the USA and French Empire. Public engagement will come via an Online Learning Resource organized with the British Library aimed principally at schools, where the Key Stage 3 History curriculum includes material on the slave trade, abolition of slavery, Britain’s 19th-century global impact and empire. We will work with community-led organisations, Warwick’s Outreach Team and the British Library’s Learning Team to ensure that the topic will be appealing to students, especially those of African and African-Caribbean descent. We will be inviting local teachers in the West Midlands to workshops on the Online Learning Resource, repeating these in London. Follow-up visits will also be offered to schools. For the wider public, especially Black and Minority Ethnic communities in the Midlands and London, we intend to deliver public talks to coincide with 2014-18, as well as mount an exhibition at the Modern Records Centre at Warwick.